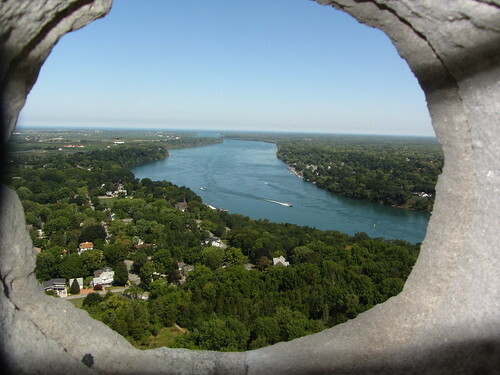 Queenston Heights Park is the site of a War of 1812 battle in which Sir Isaac Brock was killed. A 50-m. (150-ft.) monument, that is perched above the Niagara Escarpment, was built in his honor. Surrounding the monument is a recreational park that contains a vast picnic area with open-air tables and covered pavilions. Also located here are a bandshell, tennis courts and hiking trails. Food is available at a snack bar or at Queenston Heights Restaurant (open seasonally). Queenston Heights Park is located on top of the 106 m. (350-ft.) Niagara Escarpment, which allows for spectacular views of the lower Niagara River, surrounding countryside, Lake Ontario, and the Toronto skyline on clear days. It was here that the Falls were first formed over 10,000 years ago. The Bruce Trail, which follows the escarpment 780 km (520 miles) to Tobermory, also starts here.